This is my entry to “Mistress of spices” event hosted by Mythili. Why did I select this least known spice? When I read about this event, two things immediately came to my mind. The first was ‘Asafoetida’, the most famous spice used in most of the Konkani food. 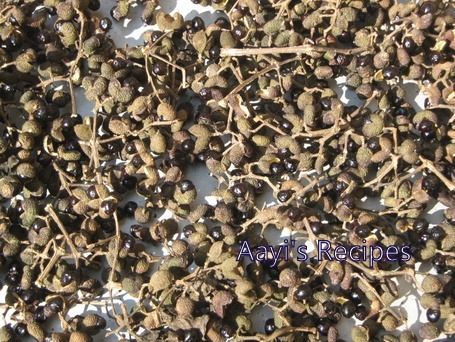 The second was Teppal, the most popular ‘Konkani spice’. Now, why am I calling it a ‘Konkani spice’? Because till today I haven’t seen anybody else using this spice. But after reading this and wiki, I came to know, its used in some other cuisines also. I thought I should write about this so that my Non-Konkani readers will get to know about this spice. We get to see a lot Teppal trees at our native. The trees have very strong thorns. I still remember, when we were kids, we used to fill the fruits of green, fresh teppal into piston like cylinders called “Petnoli“. The piston is pushed to pop the teppal with a ‘phuut’ sound like a bullet. We used to aim it at each other like pistol, unlike any other fruit used in petnoli, teppal hurts more :D.
Mostly grown in : the states of Maharashtra and Karnataka in India. Part of the plant : These are the fruits of the plant. The tree bears fruits in Monsoon. During this time, the fresh fruits are used for all the dishes. They are dried and stored for the use in other seasons. When dried, they open up and the black colored seeds can be seen. The seeds are discarded and only the outer layer of the fruit is stored. Appearance : When they are fresh, the fruits are dark green in color. They dry to a dark brown color and split to reveal a creamy white interior. Medicinal uses: A decoction of teppal is a good cure for dysentery. The spice is known for its anti flatulent properties. (I have picked this up from a book, but haven’t actually seen teppal being used for any medicinal uses). Uses in kitchen : This is mostly used in Fish preparations and a few vegetarian dishes, with a coconut masala. This has a strong woody aroma, so it should not be ground with coconut (if it is ground by mistake, the dish gets a very strong and biting taste. The tongue starts tingling 😀 ). While using in gravy, these are slightly crushed in 1 tbl spn of water and added to masala. At the time of eating, teppal is not consumed and discarded. Well, this is all the information I have about the teppal. If you know anything more than this, please feel free to leave a comment here and I will update this post. 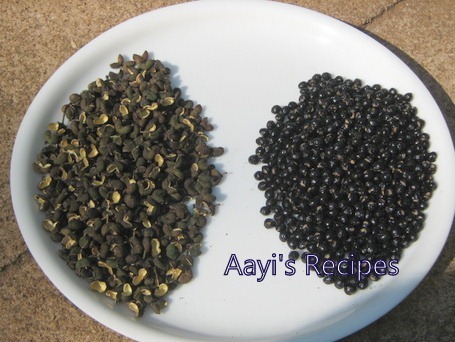 Some recipes that make use of teppal are Pumpkin-peas masala(Dudde randayi), fish curry, fish sidedish, chutney, ridgegourd gravy(gosale ambat), bhende sukke and many more. Seeds separated. Discard the seeds. Dry some more after removing the seeds. Came here from your comment at Indira’s blog. Teppal is completely new to me ~ I am going to look for it next time I am shopping. It sounds very interesting. Thanks for the great description! Shilpa: Thanks Linda. I am not sure if you get Teppal here in US. In India also, it could be found in Mangalore shops :(. you can easily get this in any Chinese grocery in US. Shilpa: Yes, its indeed a very great spice :). Shilpa, Indeed a rare spice. Nice description.and well presented..Thanks for sharing this..
Shilpa: Thanks for the comment Sudha. This is a totallyy new spice (at least to me). Have never heard about something like that . I really like your spirit of enlightening us, Ms. Illuminatus 😛 (Angels and Demona, Dan Brown). Thanks for a wonderful write up and I really appreciate your participation. Shilpa : Wow..You too Dan Brown fan club??? I am excited :D. You know, after reading his novels, we read his biography also :D.
I just love the flavor of Teppal, especially in the fish curries. Can’t wait to see your collection of Teppal recipies. Shilpa : Shalini, I will post the recipes soon :). Keep visiting. Yuuuummmmm. Isnt it the most exotic spice in the world? I am a great fan of Theppal (Kamtekai in Kannada?). I got to know it only after my marriage, but I got hooked on to it the first time I tasted it. And I know that ‘tingling tongue’ feeling. Nothing helps take it away. You can only wait till it vanishes. It can be quite notorious, I must say. Never heard of this spice. Something new to me. Sharing for sharing the info. i find this spice in the Chinese and Thai groceries also under the name “szechuan/sichuan pepper” or “wild pepper”. it is related to citrus fruits(oranges, limes, lemons etc) and because of that it was banned from U.S. import for several years because of a potential to carry disease and ruin the citrus crops…..but the ban was not enforced too well …..i’ve bought it many times during the time the ban was in place….it is not banned now, so it’s getting easier to find. it is absolutely necessary for certain chinese dishes from szechuan. i was suprised to learn it was important to cuisines in India as well!!! Ohh thats a great news. I thought it is still not available in US. In India it is used only in few places, in Goa and few places in Karnataka. Except that no one knows about it. BTW..I had checked for this in Chinese store. They didn’t know about this. I will check in Thai store next time. Thanks a lot. Good write up on teppaL. I have been asking what “Teppal” is known in English so that I cna some of my mom’s recipes. My mom finally mentioned to me it is known as “szechuan/sichuan pepper” and is available even in Dubai in the Chinese shops. And I did a googled to check what whether Teppal was known by any other name , and I got to this page. Cool , now I can just go to some Chinese shop and ask them whether they have “szechuan/sichuan pepper” . This Is seema we also use this Teppal.without this theppal we should not make some fish curry.in our native(gokarn)this is called jumman kai or jumman kari. Great write up, Shilpa. Very informative too. This is a completely new spice for me too. Now I will add this to my shopping list right away (from Bombay). Szechuan peppercorn is available mailorder in the US from either Penzeys (www.penzeys.com) or Kalustyans (www.kalustyans.com). Does the Chinese stuff taste the same as the version from South India? They seem to be different species botanically. Very nice and informative essay on Teppal. If I am not mistaken many Koddel like KulthaKoddel(horsegram garlic Tadka) or BlackeyePeas koddel and specially Avare bendi is flavored with Teppal. Eventhough I always used to bring fresh Teppal from India here, I hardly have prepared any dish with Teppal as my wife does not enjoy dish with this spice. I used to enjoy just a smell of Teppal and dishes prepared by my Mom in those old days but memory will come back as whenever you introduce dish with Teppal and I will try out one by one (may be, let me know in advance and I will fly to Kansas just to Taste the dish!!!!!). btw I looked into Spice Board of India site from Cochi, “http://www.indianspices.com/” , all the spices with pictures are posted except Teppal, because may be very few people use it in India and has no export/market value. I don’t know weather anbody has mentioned about this site in Mythilli’s festival of spices. Glad to see Konkani recipes. I am a visitor from India. Is teppal available in USA?.further I would like to know the mixer/grinders (indian or of US)which are suitable for konkani recipes..i.e grinding of coconut to smooth paste etc. Here my daughter has Sumeet which now requires repairs/spare parts. these are not available now even in India now. Please advice. Shilpa: I have heard that teppal(sichuan pepper) is available in few Chinese markets. But they are very rare. Needs a lot of searching. I have ordered for a new Sumeet last week from here, so you can check the link for any spare parts. I had a blender which I had bought in Walmart, but after using for about 1 year, now it is almost gone. These are not at all sturdy. They can’t grind to a smooth paste but can be used if Indian mixers are not there. Hi,thank u very much. Teppal in India, in some parts.i.e.shimoga thirthahalli side is called as Jummankai. I had been fanatsizing the last few days for some real konkani style food n didn’t know where I could find really good and easy-to -follow instructions – stumbling onto ur website was a godsend! I have been stuck onto it the last couple of days n can’t wait to try out some of the stuff especially the vaali bhaji ambat– I luv it! I am a malayali but was born n raised in Bombay. We had a lot of konkani friends so konkani food is not new to me, esp since the ingredients are quite similar to what we use in Kerala. I love most of the food, which always made my friend’s mom happy, as her kids didn’t really appreciate it as much. 😀 I guess my mom had the same complaint with me- case of the neighbour’s grass being always greener!! The teppal sounds very much like what we call Tippali in Malayalam. It is used in making rasams and also as a medicine if I am not mistaken. My mother would make a rasam and add this spice to it after I had my baby. It is one of the “prescribed” confinement foods, I believe, in Kerala. it is indeed a wonderful ingredient n gives the food a real kick!! I need to know if this is available in Toronto Canada. Please advise. I am so happy to see details on Teppal, I usually bring from Goa. However, I am wondering if we can find some here in Toronto as my Goan friends go ooh ahhing about Bangda curry with Teppal just the way it is made in Goa. This is very good site … keep up the good work and keep our roots strong. Shilpa: I don’t think this spice is used in Tamil coking. It is very specific to Konkan region. Tamil name is kaNDa tippili. In tamil it is called sezhan milagu, in telugu it is calledTokamiriyalu. Had never heard of this spice before. Thanks a lot for sharing it with us! I tried to buy teppal in all the Indian stores around Pleasanton/Dublin/Oakland/Fremont in the Bay area but failed. Could someone please advise where I could buy this spice. In Marathi it is called Tirpal and I used to buy it from Thakurs in Matunga (West) in Mumbai. Shilpa: As far as I know, it is not available in US. But one of my friends told me there is few shops which sell teppal, but its very rare. Thank u very much for giving information about Teppal. Am from coastal karnataka but now staying at bangalaore and miss all dishes which are there in ur site. But somehow i get inspiration to prepare some of them here at home whenever i visit ur website. We call Teppal as Jummina Kaayi in kannada. Always when i go to my mom’s place amma packs a few dried bunches of Teppal. U r doing a good job..keep posting. And am very much thankful to u. This is my first ever site i visited n its amaging.All ur dishes r perfect,without any doubt. ive heard alot about this spice and happen to have eaten it sometime back and liked the distinct aroma of it. Can you help me out as to where i can find this spice in bangalore? Is it called Kamtekai by any chance? Shilpa: I don’t know if it is available in Bangalore. In malawani we called tirphalhe……. Am from Bangalore since 1970 and close to all konkanis (coastal karnataka). No, Teppal/Tirphal etc ARE NOT AVAILABLE IN BANGALORE. We get it from Mangalore,Karwar etc. from friends; also from Shirali which we/friends visit often. This fruit is indegenous to Konkan (south of Mumbai,) costal place; Goa and mostly North/South kanara. Possibly, Konkanis who migrated to Kerala from Mangalore/Udupi etc. must be using it. I wud like2 write abt the medicinal values of teppal, which iv read from various websites. its aromatic numbing taste is ofcourse mouthwatering. but u shud kno that itz helpful in curing caugh, cold, it reduces vomiting, it kills tapeworms in the stomach, it is also applied in the area of pain as it is said to numb the pain effect. A very rare spices available in costal reagion of karnataka n maharastra. very fragrant after fully ripenened and dried. 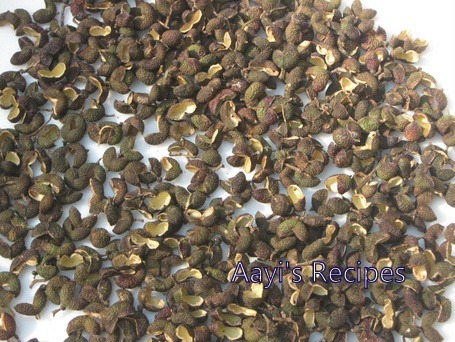 in kokan area its used in all most all fish recepies. In very small quantity it gives good taste. A good appetiser,digestive, wormicidal medicinal properties. Paste of dried fruit can be applied over fore head in headache in small amount. since they have a store just down the road from me in LA. with. Maybe mixed with Thai chilli which hits the back of the tongue. top notch and they have really done their homework in researching the right mix of spices. Could anyone Pleeeeaaaase give me the manglorean recipe for a baby (talak) chicken soup which is made for women after confinement – giving birth to a baby. It is called Talka so soup. No, sundakkai and triphal are not same. You cannot eat triphal as it is, used only for flavor. one of my konkani friend’s mom also called it “marathi moggu”. having been born n brought up in m’lor i did’nt knw about it until aunty mentioned it in her recipe. i alwys visit this site for recipes. hi, i think sichuan pepper corns are available in Karnataka.It is sold in small packets in Kushalnagar(a buddhist settlement near coorg. )Costs about forty rupees for 50gm. Shilpa , if you could please post TEPPALA CHUTNI, would be very happy. Longing to eat the authentic managalore style. Teppal can also be added to stored rice. It keeps all the bugs away. Hope this helps those who have this problem! As a kid, I hated Theppal. But now I love it.I got some back with me on my last visit to India. How I use it is, I fry 2-3 theppal in a little oil and then pound it finely with a mortar and pestle and then add that powder to the curries – in dhanya bendis, especially and it tastes really yummy and you don’t have to bite itno pieces of theppal…Try it and let me know how you find it using this way.. I was googling for the name of this spice in English as I was wondering if I can get this here in South Africa and thus landed on your page. Nice informative page and didnt know in detail about this spice except that it was used extensively in fish curries. I am a GSB before marriage and its commonly used in GSB cuisines. I was looking for the english name for this spice and landed here. Being a native of mumbai that is East indian and residing at bandra my mum would always make home made fish and meat masala store them into beer bottles. we call it Bottle masala.There are more then 21 spices that go into this concoction and tirphal is one of them.I guess very few people are familiar with this spice not to mention a few.. Dagad phool, Jaipatri, Maipatri etc. I think the English name for Triphal is Sichuan pepper. One of my friends asked me to get timur and jambo from Nepal…never knew these spices however stumbled upon them in uttarakhand.I have also planted the thorny timur tree this year in my garden in India.I was lucky to get some fresh timur from the forest.This is a very valued spice for toothpaste companies.I intend to plant some more over the current year. Tirphal although looks similar to the Szechuan Pepper, but if you look carefully they both are different spices & they smell & taste different too. The Szechuan pepper available in chinese or thai shops is the Nepalese variety & not the south Indian one. Both have different latin names & should not be confused with each other. 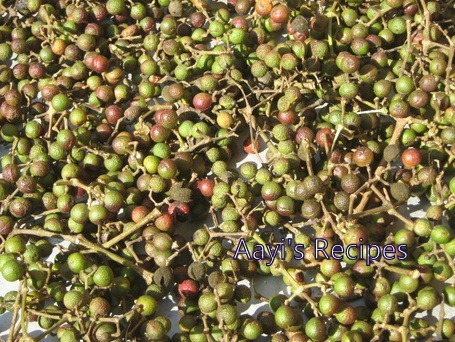 Tirphal known as South Indian Tomar is known as Xanthoxylum rhesta. I have eaten a fish curry flavoured with teppal long ago in Hubli 1972to1976. It was a restaurant called Lakshmi Hotel, a tiny wayside joint near Mooru Savira Mutt. It was a heavenly taste which I have not experienced anywhere else. The owner was from Honnavar in North Kanara. They call it as Jhumki Kayi.I didn’t know that it was Sichuan Pepper then!!! Only now that I know it, I am going to add this in all my Fish curries. I have brought some of it from New Zealand and Australia. I normally used it only in my chinese preparations. Now I am glad that Teppal and Tirphala are same despite the geographical species differ. May be its a sub species.Nevertheless, the taste and flavour of this spice is unforgettable. Just a few minutes back, I had some sort of a Gujarat Spicy Papdi where I found a few corns fried. Thanks for this insight. Why am I unable to post??? My post is not going through!!! I saw a Sanjeev Kapoor YouTube video on making Chholay masala and heard for the first time about this spice.. Only he called it trifala (Tree-fuh-laa). Also when I went to my regular grocery store (Chheda Grains, near Matunga Central railway stn, Mumbai) the boy whome I asked about this Goan spice called tirfal, called it same–Trifala.. I thought he is mistaking it with the famous Ayurvedic Medicine.. So I Googled it to show him a picture (Pic from your write up) and he confirmed that that’s exactly what he calls Trifala. I guess Mumbaikars or North Indians call it trifala. same pronunciation as triphala, Ayurvedic medicine made from Awla-Bahida-Harde. Thanks for the write up. Now I’ll be careful not to use too many just because it looks so tiny and harmless! Super Fragrance while taking Head Bath. In Urdu It is called Muhfatta. This spice which you describe by pictures( Triphal ) is a very commen spice for Nepalese kitchen and its Nepalese name is Timur. Whole dryed and powdered “Timur” can be purchased in the market. Timur is different from Tirphal. Tirphal is z. rhetsa and timur is Z. alatum. I am a big fan of Konkani food and its people. Whenever I visit Goa I frequent a quiet local restaurant in South Goa and more than the waves I find myself attracted to this small eatery with a sprawling garden by a stream of back water. Under the cool shades of coconut trees I first discovered triphala (please note though I have heard of Triphala from my mom and grandmom, I never knew how it looked, it is through my ardent search to discover the amazing spice that I landed up here, I cant be more enough glad). Am not sure whether I first tasted this distinct spice in one of the Goan curries or the mind blowing Ambot Tik in that eatery but I have completely fallen in love with what this amazing spice can do to fish curries. Thank you very much for the info and wish you the best in your culinary adventures.